This afternoon, we left the comfortable confines of Denver to drive up into the mountains of Gilpin County. The district that Jared is running in is quite large and covers major metropolitan areas, college towns like Boulder, and less heavily developed areas like Gilpin. 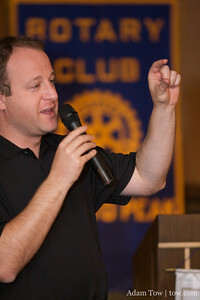 The Gilpin County Rotary Club met today inside the Fortune Valley Casino. I didn’t realize that some parts of Colorado have legalized gambling; there were a number of establishments all along Main Street in Central City. When I was in elementary school, I participated in a four-way speech contest at my local Rotary Club. My speech was title, “Smoking: The Clouding of the Nation” and I actually won the contest! I have a photo of little Adam holding a trophy with one of the Rotary Club Members; I’ll have to dig that up and post it to accompany this article. The people in the meeting have some good questions for Jared about the economy and healthcare. And, as always, it was great to hear Jared’s responses, which were complex and full of nuances. The answers to political questions are not always black and white, red or blue. I’ve never been really active in local or national politics, though I do have experience with my fair share of Silicon Valley protests and politics. Maybe one day, after I’ve achieved other goals in my life, I’ll join Jared on the national scene! After all, I’ve got to leave all options on the table! Click here to see the photos from the event!